pHformula provides a commitment to younger-looking, healthier skin; improvements are noticeable from the first treatment with optimal results achieved through regular treatments and through using our complementary homecare support products.ic by The Signature because it is regarded internationally as the go-to skin resurfacing treatment that truly transforms the skin with minimum downtime and no peel. It is the first pharma cosmeceutical combining maximum strength active acids with a unique trans-epidermal delivery system PH-DVC. This innovation allows the rapid delivery of the acids with minimal epidermal trauma. pHformula boasts a unique combination of alpha and beta hydroxyl acids as well as anti-oxidants, anti-inflammatories, vitamins and trace elements which stimulate cellular repair and turnover; in turn increasing collagenesis and improving elastin fibres, tyrosinase inhibition and sebostatic control as well as regulating and suppressing the symptoms associated with sensitive skin. Treatment Course of a minimum of 6 sessions are recommended. One treatment every two weeks. Active and effective skin resurfacing solutions for the treatment of typical signs of ageing such as photo-ageing, pigment changes, dull sallow appearance, superficial and medium expression lines. The unique pHformula powerclay formula used in the M.E.L.A. resurfacing treatments is designed to reduce the accumulation of epidermally located melanin. This inhibits the enzymatic activity of tyrosinase, stimulates epidermal differentiation and accelerates epidermal cellular turnover causing the removal of already formed melanin pigment. Due to the innovative highly effective mode of action, significant visible results are obtained with minimal risk. The unique combination of actives in the pHformula A.C.N.E. solutions are specifically formulated to correct the main acne manifestations such as comedones, papules and pustules. It was designed to powerfully act on the 4 factors that trigger acne: Seborrhoea, Hyperkeratinisation, Microbial colonisation (P acnes) and Inflammation. This is an advanced system which addresses early signs of cutaneous damage. Maximum Vitamin C concentration levels are achieved in a highly absorbable medium. L-ascorbic acid helps to strengthen the skin’s collagen and elastin network. The treatment is suited to use on photo-aged and pigmented skin and can help improve uneven pigmentation when performed regularly. This treatment focuses on specific problem areas like the delicate eye area as well as the bar code around the mouth area. Natural collagen induction therapy, with a unique M.E.S.O. glow solution is applied to focus on these problem areas. The combination of specific acids, retinol, vitamin C, cyto-stim, THPE and peptides provides immediate visible results, leaving the skin radiant, firm and well hydrated. This treatment is designed to create microscopic channels with the M.E.S.O. glow device, which stimulates the skin’s natural defences to repair and produce collagen and proteins within the treated areas. 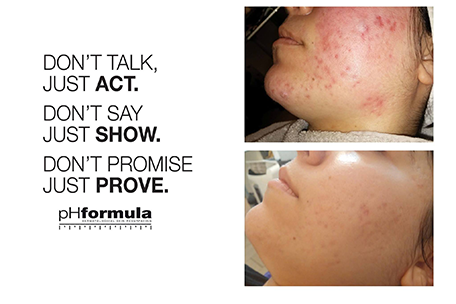 The pHformula actives are applied to the skin afterwards to ensure effective absorption and superior stimulation. This results in the skins thickness being increased, smoothing of superficial scars, reducing stretch marks and erasing fine lines. Ideal to treat: Fine lines, Wrinkles, Stretch marks, Acne scarring, Pigmentation. Due to the loss of soft tissue and muscle volume, the skin in the hands significantly thin as we age, making hands appear much older. The pHformula S.O.F.T. resurfacing cream is formulated with a gentle combination of Salicylic acid and Retinol to assist in superficial exfoliation and cell renewal. M.E.L.A. 2 powerclay is a powerful age spot treatment designed to reduce the accumulation of excess melanin. The V.I.T.A. C activator triggers collagen production, offers antioxidant properties an assist in regulation of melanin formation..